The arthropods of the air are the clade Pterygota (“winged”), known as “winged insects” and represented here by a bee, a praying mantis, and a dragonfly. The bee represents Endopterygota (“inner winged”), the massively successful clade of insects that undergo complete metamorphosis (larva, pupa, and imago or adult). They first evolved around 300 million years ago, and they have since evolved into flies, fleas, beetles, ants, wasps, and moths. Around a 100 million years ago, moths co-evolved with flowering plants as their pollinators. 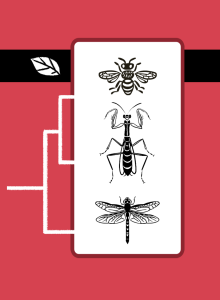 One sort of wasp also co-evolved with flowering plants as a pollinator; we call them bees. The praying mantis represents Exopterygota (“outer winged”), a quite successful clade of insects whose young resemble the adult form. The young develop through multiple stages called instars (“forms”), and their wings develop on the outsides of their bodies, not within a pupa shell, as with Endopterygota. This clade, which preceded Endopterygota, includes cockroaches, termites, grasshoppers, lice, and more. The bee and mantis together represent Neoptera (“new wings”), the clade comprising all insects that can fold their wings back over their abdomens. The most successful neopterans are those that have evolved eusocial lifestyles with non-reproducing workers, such as bees, ants, and termites. The dragonfly represents the few species within Pterygota that are not neopterans. Dragonflies begin life as water breathing predators, and they develop toward the adult form one molt at a time until they finally climb out of the water, converting to adults that breathe air and fly. Nearly all insects are winged insects, although silverfish and some other forms are not. Fleas are winged insects (pterygotes) even though their ancestors lost their wings over 100 million years ago. When I first chose three winged insects, the second was a butterfly because butterflies are highly recognizable. The bee and the butterfly, however, are both endopterygotes, so there was no insect to represent the important clade of cockroaches and grasshoppers. My plan was to swap in a cockroach for the butterfly because the cockroach has an ancient form perhaps similar to the earliest exopterygotes. A prominent backer, however, requested a praying mantis, and the mantis is a fine representative of Exopterygota. Karen drew the mantis face on to bring out all its character, but we might yet switch it to back view, like the others.